The mobile old-school racer from Aquiris Game Studio is thinking bigger for an all-new entry on PC and consoles. 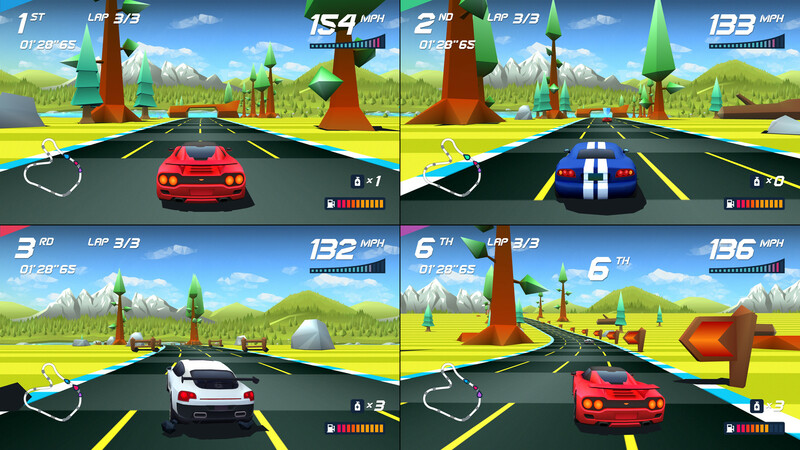 Mobile game developer Aquiris Game Studio hasn't forgotten the golden age of the arcade racer, harboring fond memories of early 90s games like Outrun and Top Gear. That's why the studio released Horizon Chase for mobile devices in 2015 to praise from critics and players alike. But the Brazilian developer isn't finished with this game just yet, as evidenced by Shacknews' hands-on from GDC 2018 earlier this year. On Monday, Aquiris announced that Horizon Chase Turbo would be coming to PC and consoles. But this isn't merely a port of 2015's Horizon Chase. According to the initial Facebook announcement, Turbo is being built from the ground up to include 109 tracks and 31 unlockable cars, along with new Tournament and Endurance modes and an updated interface. The game will retain the 16-bit visual aesthetic of the mobile original, making this feel like a throwback racer. Our own Blake Morse vouched for the old-school feel, referring to it as a modernized Pole Position. For those seeking racing games as they used to be, Horizon Chase Turbo is set to hit PC and PlayStation 4 on May 15. Xbox One and Nintendo Switch versions are set to release later in 2018.